Easy to Assemble is a wacky online video series created and written by Illeana Douglas and sponsored by Ikea. It’s based on an earlier online show created by Douglas called Supermarket of the Stars. Douglas later pitched it to Ikea and adapted it for the Swedish home furnishings giant. In both series, Douglas and the other stars (including Justine Bateman, Jeff Goldblum, Kevin Pollak and Jane Lynch) play fictionalized versions of themselves. The basic idea is that they have decided to get out of show business and start new careers as co-workers in the Ikea store in Burbank, California. Sounds like a stretch, but the series is incredibly funny and entertaining. And that’s the secret to its success as a brand property. According to Advertising Age, Easy to Assemble has racked in 5.1 million views since first going online last year and the numbers are still growing. Ikea had the vision to give Douglas the creative freedom to place entertainment ahead of marketing. That doesn’t mean the brand is relegated to the sidelines. The story takes place in the Ikea store, Ikea branding and products (including those famous Swedish meatballs) are weaved naturally into the story lines, and the brand isn’t afraid to poke fun at itself, or at peculiarly Swedish traits that are at the heart of the brand and the company. The ability not to take itself so seriously, something most brands sadly lack, makes Ikea all the more approachable and human. In one of the spoof training videos that come at the end of many episodes, Nicole Bateman advises Ikea trainees not to inform customers who have left an important component behind by mistake. When they get home, they’ll realize it’s missing, come back to buy it, and will probably pick up other items as well. “And that means repeat sales.” Of course everyone watching knows this is meant to be tongue-in-cheek, but most marketers would lack the courage for that kind of humor. I’m also impressed how Easy to Assemble has engaged with Ikea’s online fan base to promote the show. For the launch of the second season, Douglas engaged the services of CJP Digital Media, a company that creates, distributes and promotes branded entertainment properties. CJP approached fan communities like Susan Martin’s IKEAFANS.com, which receives over 320,000 unique visitors a month, according to a post on tubefilter news. CPJ went beyond just providing brand enthusiasts with YouTube embed codes. It approached the top four Ikea fan sites and gave each an embeddable online player that only works on that site, where visitors could watch the shows. The one that gets the most people to view the series will be rewarded by getting written into the second season finale. This provides benefits for everyone involved. Ikea and Easy to Assemble profit from the increased buzz and word of mouth. The fan sites are rewarded by repeat visits thanks to recurring, relevant and entertaining content. October was IKEAFANS.com’s best month ever for traffic and unique visitors, and Martin credits this in part to the show appearing on the site. The influence and effectiveness of Easy to Assemble will grow in future. Initially distributed only on YouTube and Metacafe, it now can be seen on CBS’s TV.com, My Damn Channel and Blip.tv. And it should be showing soon on Hulu, Verizon FiOS and The Hotel Network’s DoNotDisturb TV channel, if it isn’t already. I loved this quote from Susan Martin in the tubefilter news piece: “Ikea has that most elusive combination of respect and love from their customer base.” At Saatchi & Saatchi, we call brands that achieve that elusive combination Lovemarks. Ikea certainly is one. But as in any relationship, brands need to find ways to continually fuel that love. 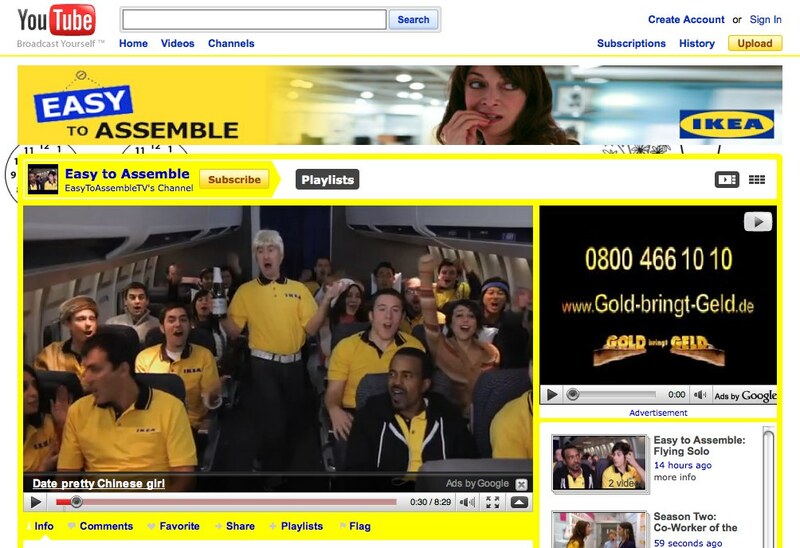 By taking branded entertainment to a new level of comedy and quality, Easy to Assemble is a great way to do that. I think the best thing here is, as you say, the way IKEA was prepared to “let go” and put the content creation in the hands of Illeana Douglas. This gives the whole thing credibility.